MOTIVATED SELLER-WANTS OFFER! Striking 1st time buyer or empty nester home. LOTS of updates including replacement windows & vinyl siding & more! Roof replaced in 2010 (per seller). The stove, refrigerator, washer, and dryer all remain. The dryer was purchased in 2010 & has 5 year warranty. Bath fitters installed. New tub, tub surround & shower (2007). Kitchen ceiling and wall to be repaired. Nice size laundry room with cainetry. 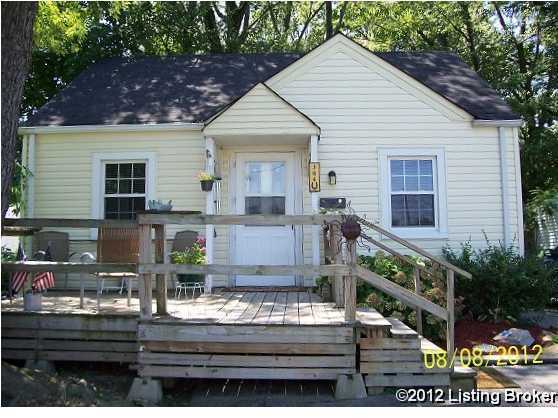 Nice location on bus line and across the street from shopping, restuarants & more! Large deck! Side drive! Seller offering First American Home Buyers 1 Year Warranty. 304 Gheens Ave, Louisville KY 40214 is a Home, with 2 bedrooms which is recently sold, it has 670 sqft, NA sized lot, and Driveway parking. A comparable Home, has 2 bedrooms and 1.5 baths, it was built in and is located at 6341 Strawberry Ln Louisville KY 40214 and for sale by its owner at $ 165,000. This home is located in the city of Louisville , in zip code 40214, this Jefferson County Home, it is in the NONE Subdivision, and HARDWOOD FOREST are nearby neighborhoods.